How to Grow Garlic ~ Everything you need to know from choosing your garlic seed planting stock to harvesting, curing and even how the garlic will store best in your home. Step 1. Choosing your garlic planting stock -Your seed stock is the most important facet of growing garlic. It all starts at the clove! Each individual clove is a garlic seed and it will grow into a bulb. Beginning with premium garlic planting seed stock will make a huge difference come harvest time. When choosing your garlic seed, plant the largest cloves of each garlic bulb, small cloves should be eaten. To separate cloves from the bulb, hold the bulb in one hand and use the other hand to break the cloves free of the bulb. Crack the cloves apart. Step 2. Preparing your soil for planting garlic - Your soil is the next most important thing to growing garlic. Naturally grown garlic loves good drainage and loamy, fertile soil. Amending the soil with naturally grown matter such as compost, manure, leaf mulch and aged straw is highly recommended. Your soil should have a neutral ph level between 6 and 7. Step 3. Planting Garlic - When to plant your garlic – We start planting garlic around Halloween and continue planting garlic thru November. This is a good guide line for almost all climates. Plant at the turning point of the seasons; with enough time for planting garlic before the ground is frozen. Try to allow three to four weeks for the cloves to settle into their winter beds, this will help the leaf development in the spring. Plant the naturally grown garlic seed 5 to 6 inches apart with the tips up. Cover the top with 3 3/4 inch to 5 inch of amended, loose dirt and gently pat down the top layer of soil. In colder climates cover your naturally grown garlic seed with 4 1/2 to 6 inches of dirt. Step 4. Mulching and irrigating garlic- After you have your garlic planting stock in the ground, it is essential to cover it with a nice layer of mulch. There are many different types of mulch. Choose from aged straw, (careful no seeds) leaf mulch, grass clippings, naturally grown compost, shredded paper. Mulch will protect your garlic seed in the cold winter months, prohibit weeds, keep the earth cool and moist during hot months and protect your topsoil from blowing away. Garlic likes to be kept evenly moist. Uneven watering may cause irregular shaped bulbs. This is where your good soil preparation and mulching becomes important. Water your garlic regularly during the leaf production stage. Apply some nitrogen rich foliage feed 2 to 3 times in spring. Step 6. Curing and Storing Garlic - Bundle your garlic plants with twine and hang to cure. Choose an area with good circulation and out of direct sunlight. Curing your garlic will take 3 to 4 weeks. You will know it is ready when you cut the first stalk, if garlic juice oozes from the stalk - it's not quite ready. 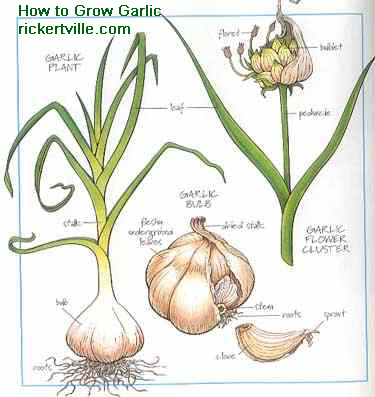 Once garlic is cured, cut off stalk leaving 1 1/2 to 2 inches. Trim roots to 1/4 inch and gently brush off outer layer of dirt being careful not to peel off outer skin. The garlic stores best in a cool dry place, 50 to 60 degrees is ideal. A root cellar or cool basement is a good storage place. Do not store the garlic in a refrigerator as the cool temperature will signal to the bulb it is time to grow, causing it to sprout in the refrigerator. Save your larger bulbs to plant the next season’s garlic; enjoy the smaller bulbs in your cooking and cuisine.